Should I use the formal form (~ます) on the buttons of an app? I'm an iOS app developer who's learning Japanese. I want to localize my app to Japanese (make a Japanese version of it, basically). For context, my app falls into the "Utilities" category on the app store. I'm wondering which one of those I should use. The first one is not a verb since it doesn't have the する at the end. So I guess it doesn't really imply that the button does a "save" action? Does this sound like, in English, when there is a button that applies some settings, instead of "Apply", it says "Application"? I think this is not appropriate, is it? The second one sounds fine, but is it ok to use the plain form here? Is it too informal to be in a Utility app? Should I use the third instead? I have seen other apps use the first and second form, like 完了 (the "Done" button) and 投稿する (I saw this in the Facebook app's "post" button). But since Facebook is a Social app, I guess it is ok to use the plain form because it sounds like Facebook is treating you like a close friend. I'm actually a developer working for a Japanese programming company. It might depend on some people, but as far as buttons go. etc. seems like the way to go. Of course your will probably need a confirmation box in which you will usually write in the ます form. Also, I would probably not use the ます form on a button. If you feel like you have to, する probably seems more natural. It doesn't feel like you have to be polite with a button, it feels like the text on a button is what the client say to you, and not what you say to the client, if that makes any sense. Please check Microsoft's Japanese Style Guide (for UI), in particular the Style section on Page 46. Use Desu-masu (ですます調, polite style), Dearu (である調, plain style) and noun phrase (体言止め) appropriately. When to use noun phrase: When sentences should be briefly and simply translated, use noun phrase. Dearu and appropriate postpositional particles can be used depending on the situation. Make sure to keep consistency on levels. Example: Titles of menus and boxes, menu commands, labels in dialog boxes, command buttons, tabs, list items in list boxes or combo boxes (in software); Titles of web pages, headings, call-outs, captions (in documents) When using noun phrase, make sure to keep the expression simple and clear. Somewhat related: Why do road signs have 止まれ, not 止まる, 止める or 止めて? (I have Programming experience) You should not use 保存します. In general, Using 保存 or 保存する in Japan. For example, Look at the picture. 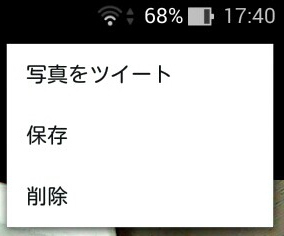 This is a Twitter(Android)'s window. It is written 保存. ...and Look at next Picture. This is a Chrome(This is also android version)'s window. It is written (something)を保存. Not the answer you're looking for? Browse other questions tagged translation verbs formality or ask your own question. Why do road signs have 止まれ, not 止まる, 止める or 止めて? How do you write “share” (as in “tell others”) in Japanese? Why is “Try Again” translated to やり直す?